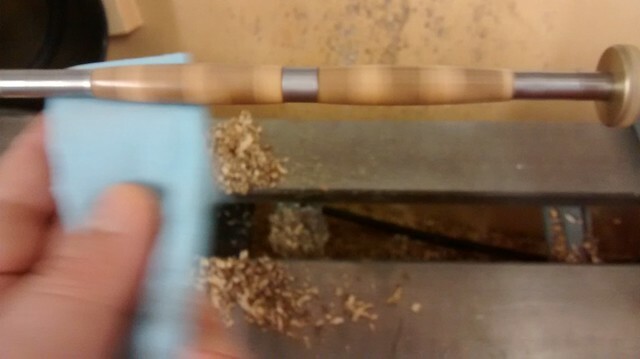 Just for fun I thought I would document the process of making a laminated Stripey Swirly Twist Pen. 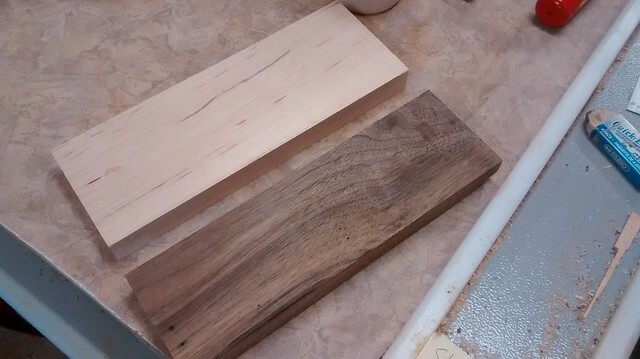 At the table saw, I ripped a bunch of thin strips from these maple and walnut scraps I had lying around. 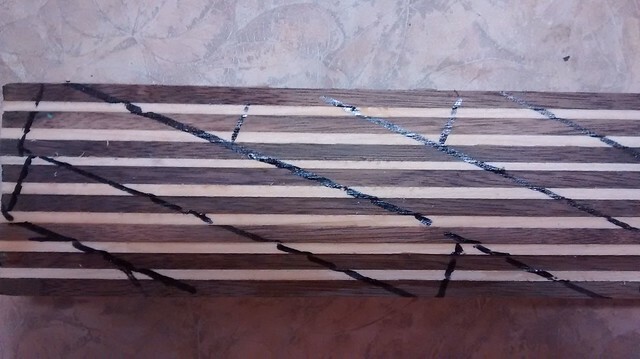 The maple and walnut strips were alternately glued together and clamped up to dry overnight. 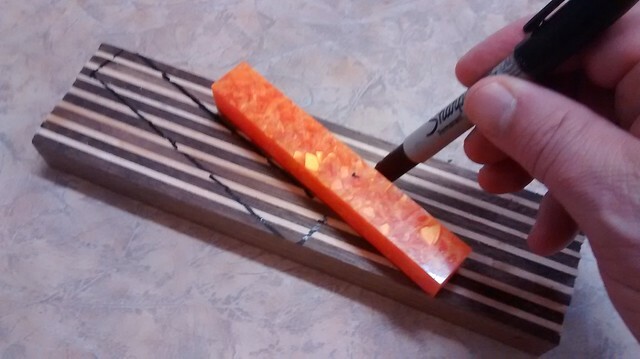 Using an acrylic blank I had nearby, I layout the blanks at an angle. 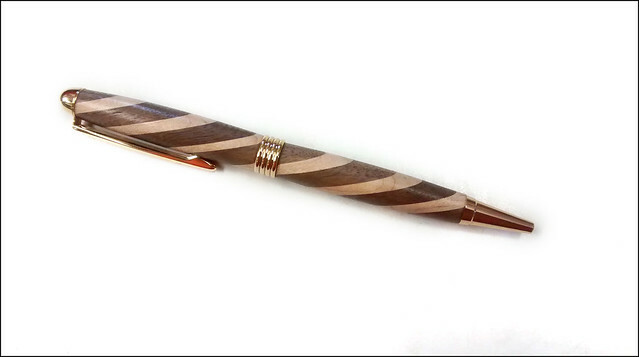 Should be able to get two or three pens out of this. 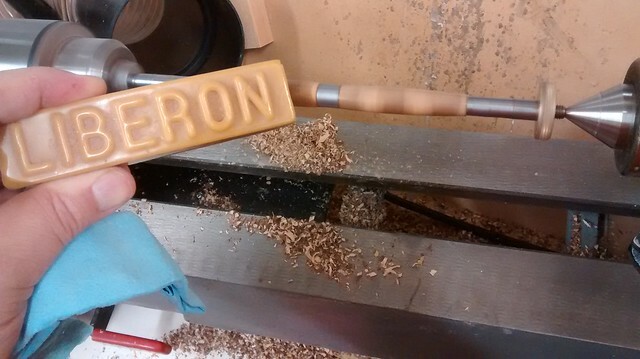 Shows the lines for cutting at the bandsaw. 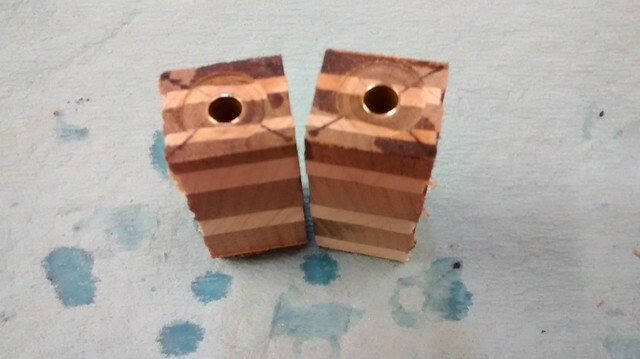 Blanks were cut at the bandsaw. Two full length ones, for sure, and I can probably use the other bits for something, at least one more pen I think. 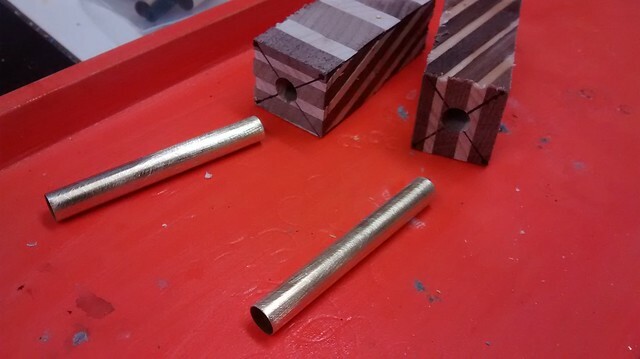 Blanks were cut to just a bit longer than the tubes, a 7mm hole drilled through each at the drill press, and now the tubes can be glued in. 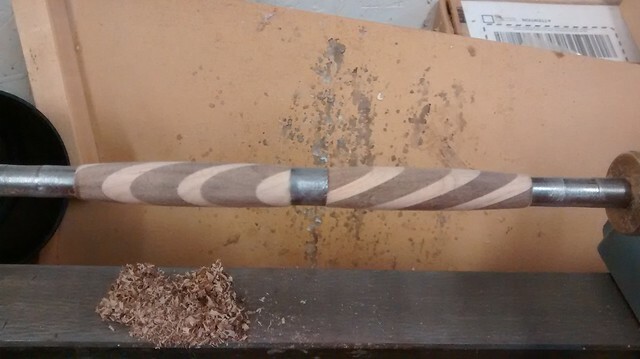 Brass tubes are glued in place, and the ends trued up with the barrel trimmer. Now comes the fun part. Shields UP! 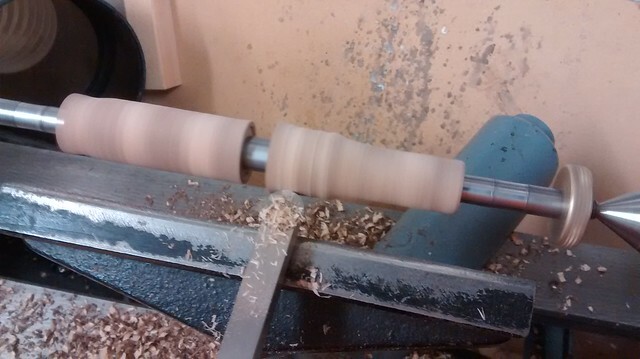 Only with the flat-bottomed Easy Wood Tool, and only after the initial rough turning to round, would I attempt the one-handed lathe action photo. 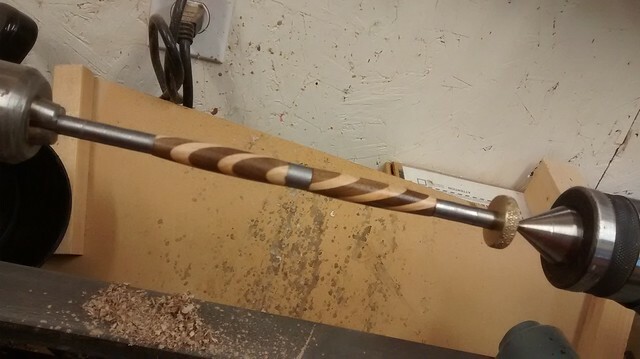 Ready for final sanding, waxing, and polishing. 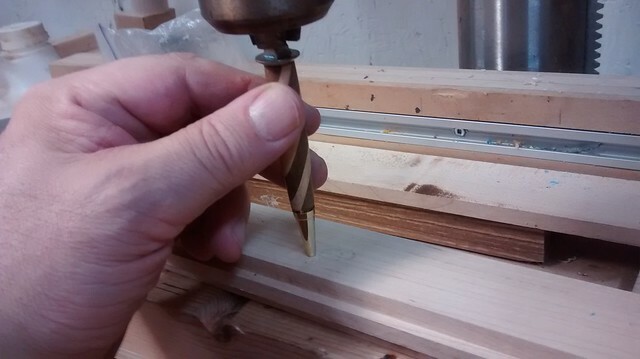 After numerous rounds of sanding, followed by the Australian part of the operation (EEE Ultra Shine and Shellawax Polish, “Australian and Proud Of It” – them, not me) I apply a final top coat of Liberon wax stick. 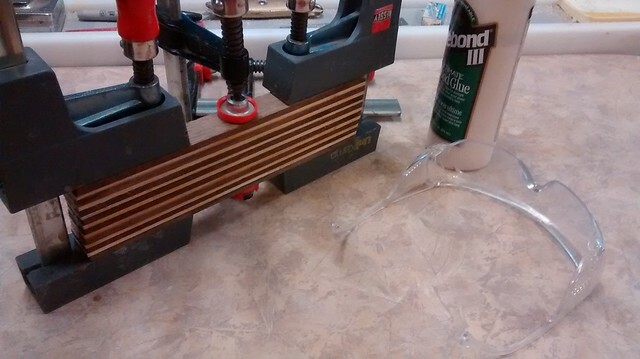 Buffing up the last coat of wax. 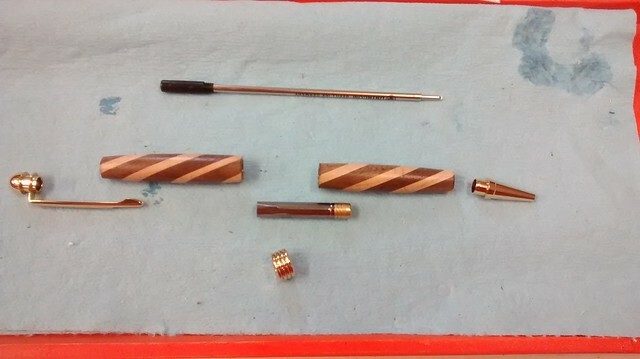 Finished with the lathe, ready to come off and be put together. 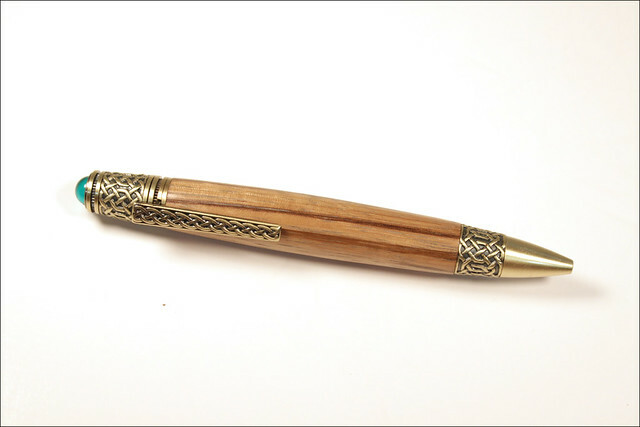 This kit has a manageable number of pieces, unlike some of the fancy schmancy kits, like rollerballs. 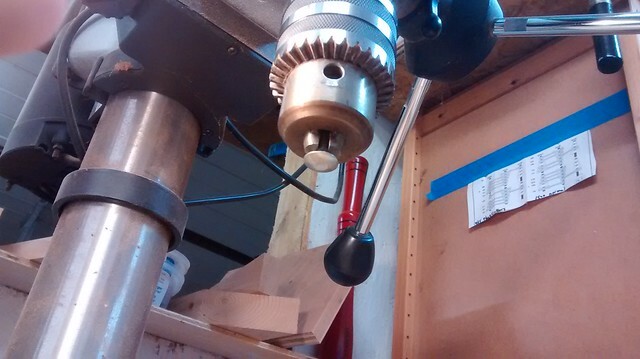 Grinding a flat spot on the head of a bolt and chucking it in the drill press makes for a pretty solid pen press. And if you’ve ever had your nib pressed, you know how painful that can be. 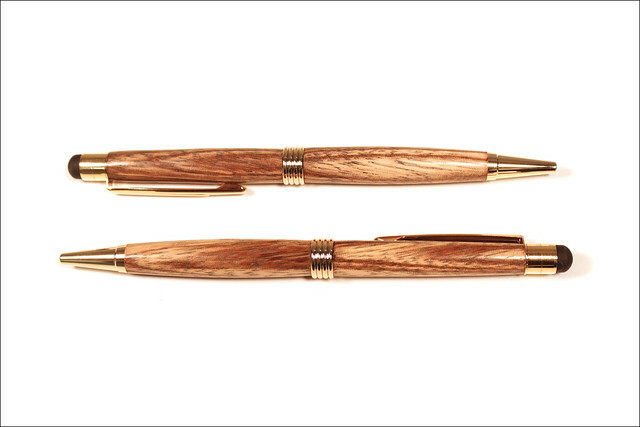 Two ballpoints in style Streamline, gold plating, with added stylus for use on phones and tablets. 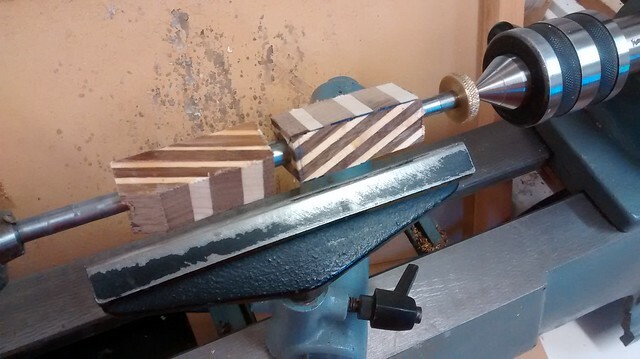 The wood is my old pal zebrawood. 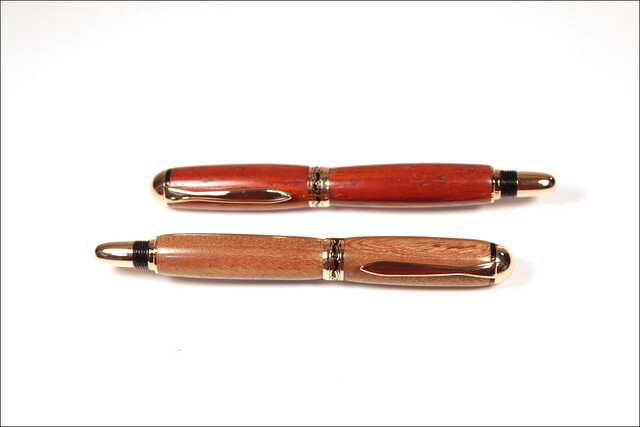 Two new pens, style is Slimline Deco in chrome plating, wood is purpleheart, and I replaced the standard end cap with a stylus tip for phones and tablets. Works on my Kindle too! 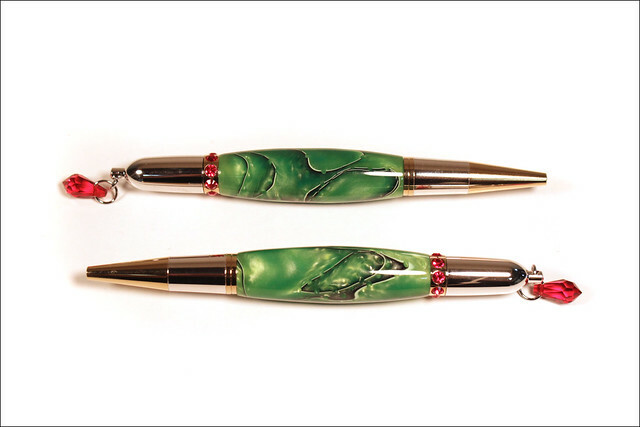 Here’s a pair of recently completed curvy Diva pens, in Cosmic Green acrylic, with red crystals. 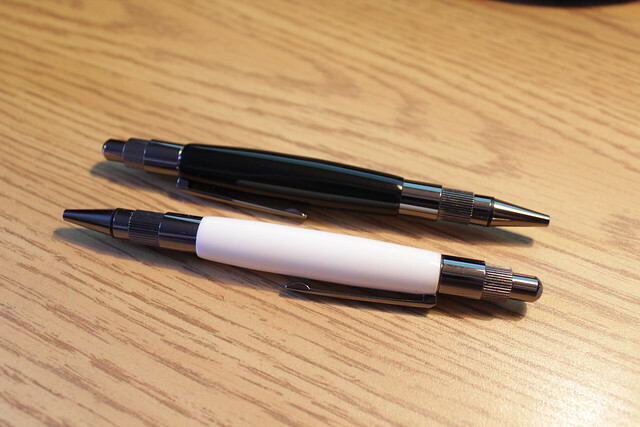 Two Stratus click pens in gunmetal plating, acrylic blanks called “White Wedding” (seen in previous post) and the much less creatively named “Solid Black”. 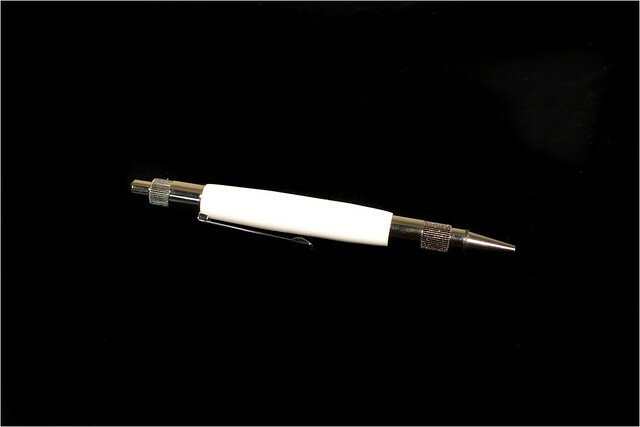 Here’s a Stratus click pen I just made, in white acrylic called “White Wedding” for some reason… I guess “Plain White” lacked pizzazz… The plating is “gun metal”, which has plenty of pizzazz. 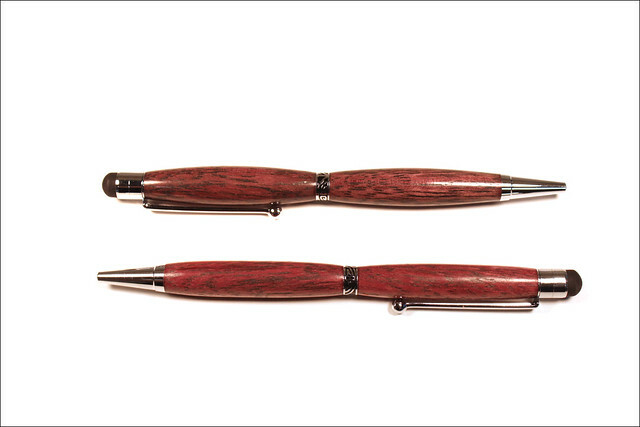 Here are a couple of pens I just finished. One of these is going to our landscaper guy, he says it matches his company colour. 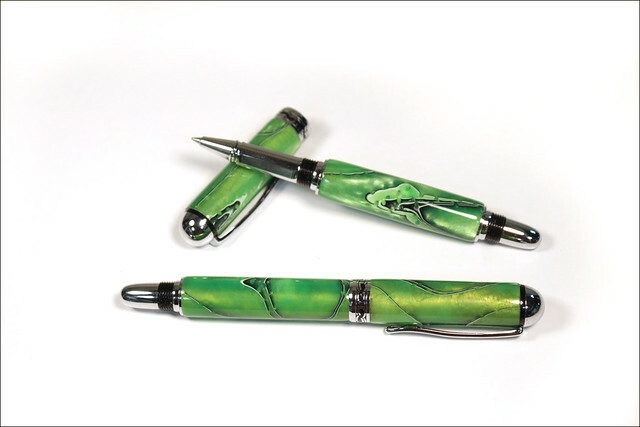 The pens are Sedona rollerballs in chrome plating, the acrylic colour is Cosmic Green. 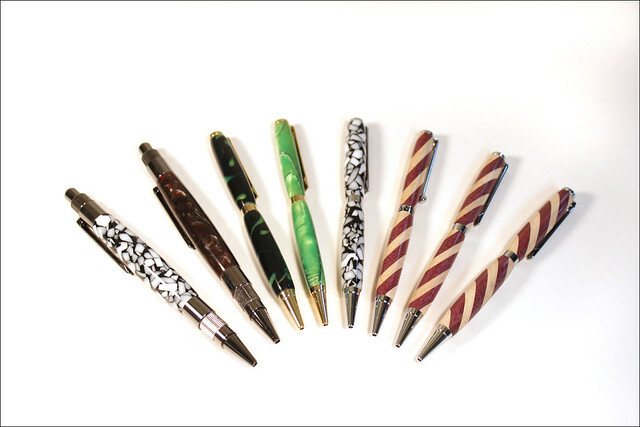 Two “Stratus” pens on the left, the rest are “Slimline” (with one “Slimline Elegant”). 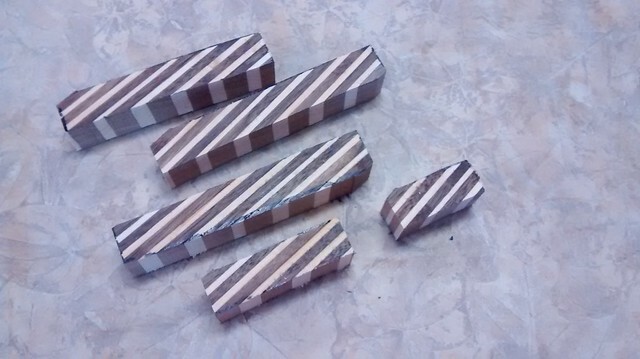 The three stripey ones on the right (including the “Elegant”) are from my own bias-cut laminations of walnut and maple. The others are acrylic. 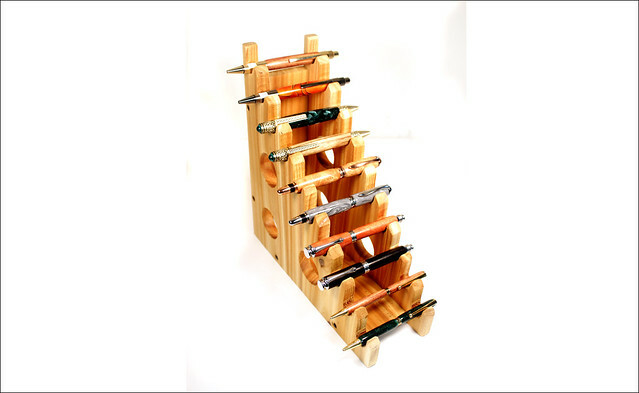 And because space can be a bit limited on the table at Market Days, depending on what I’ve got on offer (cutting boards, for example, take up a lot of room), it made sense to “go vertical”. 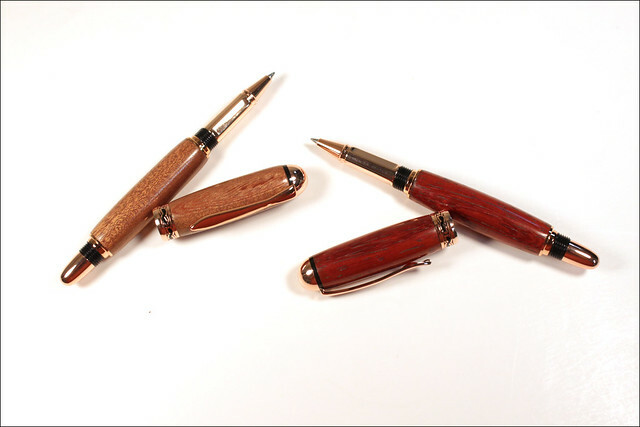 Here are some more recently turned pens, as I get ready for the December rush (he said, hopefully).